polybore: How to get a widescreen TV for free. I just got a top quality 32" wide-screen TV for free. Ok it's not High Definition (HD) but then neither is my massive DVD collection. Its not an LCD TV so its a bit big at the back however this does not bother me as our TV sits in the corner of the living room anyway. So how did I get it for free? 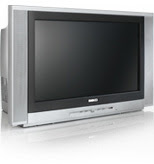 Well people are getting rid of the their CRT wide-screen TVs as they "upgrade" to LCD/ Plasma HD TV's. As the price of the LCD TVs has come down the second hand value of the old CRTs has fallen through the floor. In fact people are trashing them or paying to have them taken away. Its a bit mad because the TVs they are throwing out are only a year or two old, are excellent quality and are a lot more robust than their LCD equivalents. Save cash and do your bit for the environment at the same time and rescue a wide-screen TV from landfill. Best way to do it is to join your local freecycle group and post "wide-screen TV wanted". That's how I did it. You will not be disappointed. I could have had umpteen wide-screen TVs by now. Happy hunting. Cheers John. I think people are being put off because it's just like a hook for a really dodgy ad when in fact it may be the best bit of advice I will ever come up with. Either that or everyone has bought a LCD TV only to discover it's not that much better than their old CRT. Oh well there loss is our gain. If I come up with a free house tip thats also good for the environment I will shout it from the roof tops.